Mr. Caplan’s works have been performed in over 125 performances nationwide. He has been commissioned by the Atlanta Chamber Players, Bella Piano Trio, Bronx Arts Ensemble, Brookline Symphony Orchestra, Columbia University Wind Ensemble and New Hampshire Master Chorale, among others. Winner of a Special Citation for the American Prize in Orchestral Composition, additional recognitions include two Veridian Symphony Competition Wins, the Fifth House Ensemble Competition Grand Prize, seven ASCAP Awards, and fellowships at VCCA and the Brush Creek Foundation. 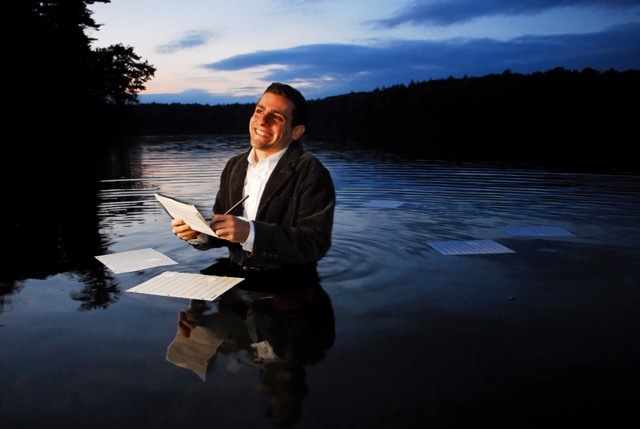 Recordings of Mr. Caplan’s music include his 2017 release You Are Not Alone, which has been featured on Apple Music’s Classical A-list, 2012 debut album Illuminations and a track on the Sinfonietta of Riverdale’s 2016 album New World Serenade (Albany Records). Mr. Caplan is the Artistic Director of Juventas New Music Ensemble. He holds degrees from Dartmouth College and the Boston Conservatory, is a voting member of the Recording Academy, and resides in Medford, Massachusetts. Krummholz Variations (2016) for flute, clarinet, 2 bassoons, 2 trumpets, 2 trombones. Performed by the Atlanta Chamber Players (recored live, April 17, 2018). My Elephant Cloud (2011) for flute, clarinet, violin, cello, piano. Performed by Juventas New Music Ensemble.